THIS IS APART OF A GROWING BUNDLE THAT IS DISCOUNTED. PLEASE TAKE A LOOK AT THE GROWING BUNDLE IF YOU ARE INTERESTED IN GETTING 'PROBLEMS OF THE DAY' FOR THE WHOLE YEAR! Word problems are always such a struggle for my kiddos. 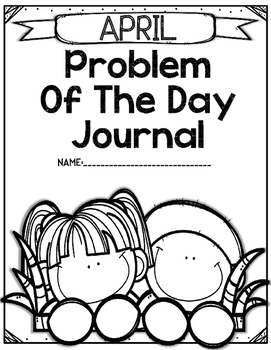 I created these “problem of the day” journals to help my students become more independent in this very important skill. We started this right away in August and it was a huge success for my kiddos. There are so many different ways for the students to break down the problem that they are sure to become confident and independent throughout the year with continued daily practice. Each month we will be adding a new pack to go along with activities/themes found in that month. 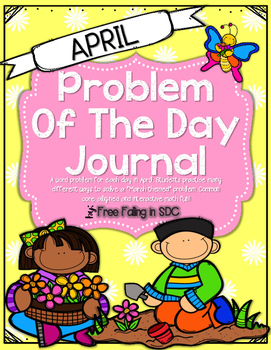 *problem of the day cover that can be used in a binder or copied on cardstock to create a monthly book that the students can work through. *20 different “problem of the day” problems that are related to the month of April. Topics include weather, spring, outdoor activities, sports, and much more. 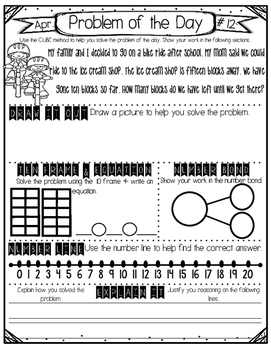 *Each ‘problem of the day’ page has many different ways to break down the word problem including: “draw it out”, “ten frames & equations”, “Number bonds”, “Number line” & “explain it”. These started out as whole group practice, but at the end of the 1st quarter, we began doing this during math centers and as independent practice. 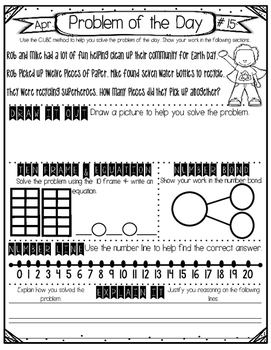 This could be a fun homework addition as well! *all graphics, fonts, and borders are credited on the last page of the pack.